Wow... I am a horrible blogger. I was really good at it once upon a time. Maybe now that I will have something to be writing about constantly, I will start it up again! 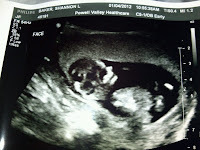 As most of your know, well those of you who have facebook, so not Shayla;), Jaran and I are expecting baby number four! I'll be 15 weeks along on Saturday, and I'm so excited to be out of the first trimester! I don't know how women have more than one baby if they get morning sickness. I was lucky to be pretty healthy with the first three. I had a smidge of sickness with Ansleigh, but boy, this baby has taken a toll on mommy dearest. And why do they call it morning sickness? Because that's the ONLY time I WASN'T sick! It was super exciting for the kids to find out. I remember when we told them they were all excited... about five minutes later McKie says, "So that means that you're pregnant, right?" Ha ha ha. I guess I just assumed they knew, but great of him to figure it out on his own. All three of them want a girl, so I hope they get their wish, or I'm afraid that they'll be devastated! I don't really care what we have, as long as it's healthy. 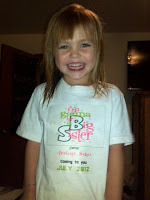 Jaran says that if we have a boy, we'll have to have another one so we can have a sister for Ansleigh. UGH! I don't know if I can do this again! But I am super excited. I'm finally starting to feel half-way decent, and I'm starting to get a tiny bit of energy back. Jaran has been great, but I think taking care of the kids at night is starting to wear on him. I have been actually able to fix dinner lately, and I think that makes us both feel better. Well, that's all for now. If anyone even reads my blog anymore, thanks for stopping by! Take Care! We are excited for you! Can't wait to find out what it is. hi! been meaning to call you. sorry i'm such a loser friend. :( so excited for your new babe! So excited for you! I hope you have a girl too. And once you have that baby you better keep up on blogging---for my sake. congrats! that is so exciting!! i hope you have a girl too so Ansleigh can have a sister!! We are super excited for you guys! Can't wait to find out what it is! Congrats Shannon~ I am so excited to meet your little guy! I love that picture of Ansleigh! She looks so excited! !